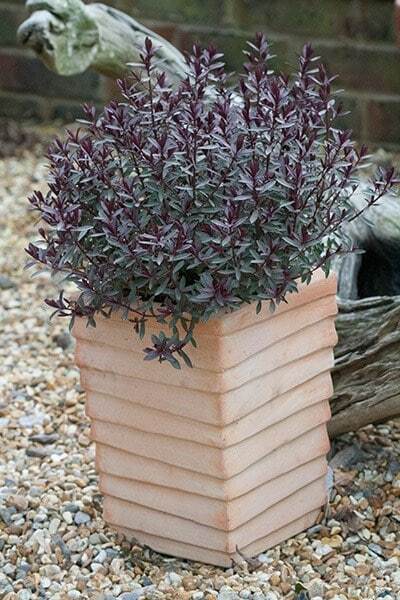 A compact form that makes an incredibly decorative and colourful container or front of border plant. 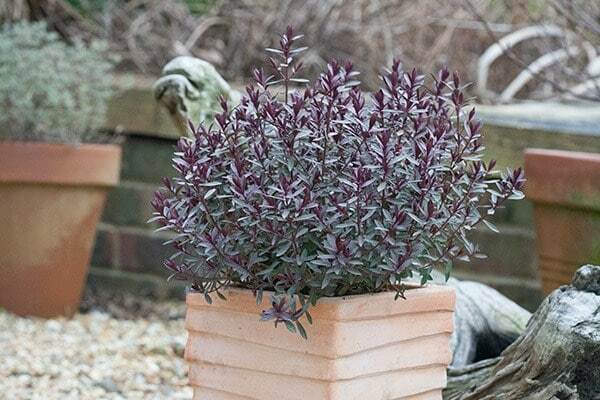 It is an evergreen shrub with glossy, red-edged, dark green leaves, which emerge with a vibrant plum flush in spring. They are held on upright reddish-purple stems that are topped with clusters of violet flowers from mid-summer to mid-autumn. This long-flowering plant is tolerant of pollution and salt-laden air. Not a constant flowerer. A great big flush around June/July, a long gap, then a few flowers in Autumn. Elegant and subtle, nice small leaves. Small on arrival and looked vulnerable in the first year. One of the 3 died. 2nd year now and the 2 are looking strong. Beautiful, eye-catching colour all year round. I have two of these planted in small beds in my patio. I've had them for 2 years and they continue to look fabulous. They have done really well considering the bed is really dry - it's right up against the wall of the house. The colour is really good - especially when the new, mid-green shoots appear in spring, contrasting with the aubergine colour of the older leaves. The background of the house wall (white) sets them off. Also, they are planted with a lime coloured grass, and visitors often comment on this striking, contrasting colour combination. I have a very small grumble which is that they haven't remained quite as compact as I expected, longer shoots keep shooting out all over the place and i have to keep pruning it. But maybe this is a response the the grass it's with, which is very vigorous - they are competing for space. It is a good product that was really healthy and arrived in very good condition. A cluster of three of these makes a perfect space filler in a garden border, and the plus side is that they stay green all year round and need very little attention. 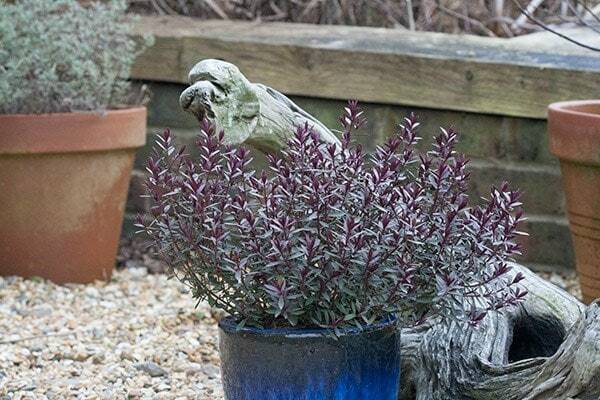 When do I cut back my Hebe? I have two Hebes in my garden, which are about 2 feet high and 4 feet across now. Will I be able to trim them back after flowering or should I wait while the spring to trim them? 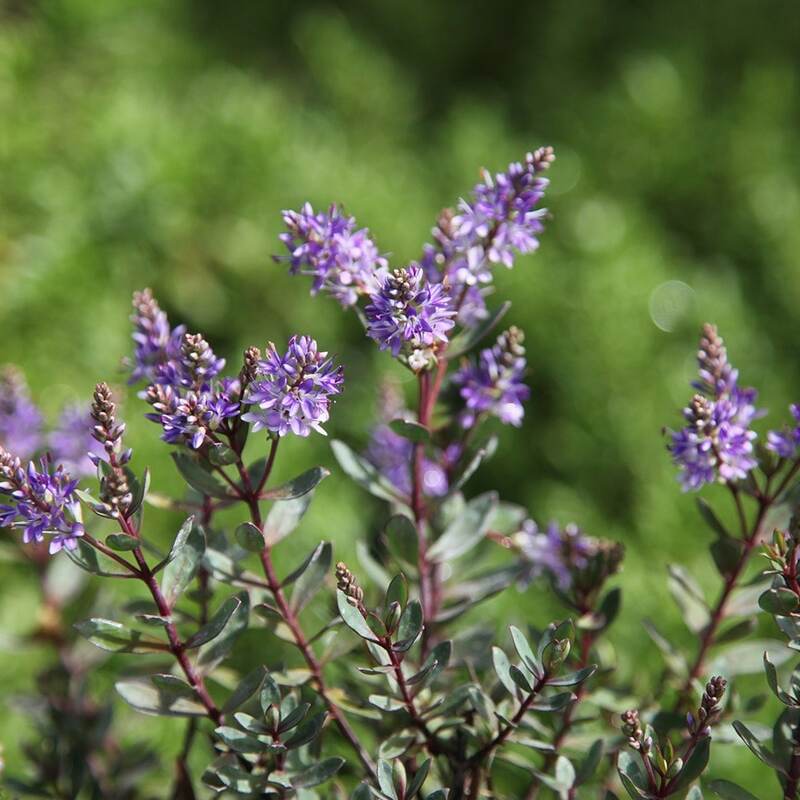 Most Hebes need very little pruning, however you can give them a light trim in mid to late spring.